PFC-supported experimentalists have developed a novel form of lattice for atoms. This lattice does not arise from a spatially varying light intensity pattern, as is the case for traditional optical lattices. Instead, laser radiation generates an effective magnetic field that changes the relative energy of atomic levels (called a Zeeman shift). Raman laser and radiofrequency (RF) fields are applied such that the atoms appear to be in the presence of a periodic magnetic field. Picture a row of bar magnets, lined up with their north and south poles alternating. Now take an atom, which can be thought of as a little magnet, and imagine bringing it close to the row of bar magnets. It will be attracted and repelled depending on its orientation with respect the magnet array. Just like in the optical lattice, atoms are free to tunnel, but with an added feature. With such experimental arrangement the atoms also make transitions between energy levels as they hop through the magnetic lattice. 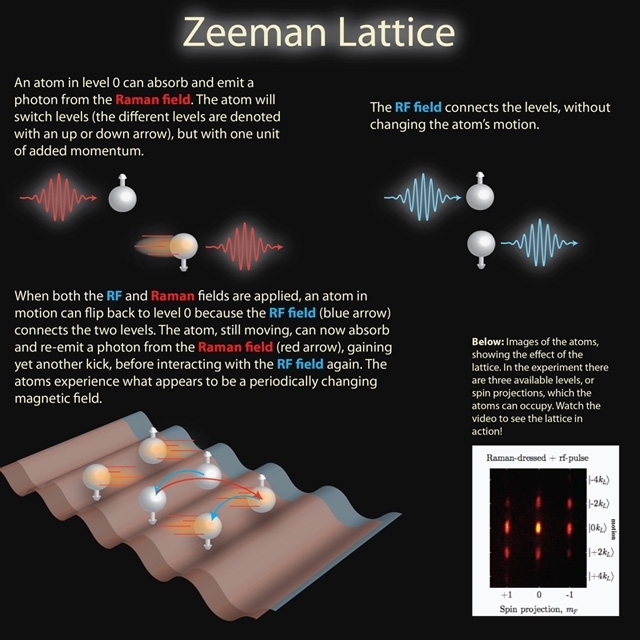 The scientists verify that the atoms experience an effective lattice by inspecting their velocity and spin distribution after releasing them from the atom trap. In the presence of the Raman magnetic field, the researchers switch on and then off the RF field, which briefly flashes on the lattice. The atoms are accelerated into higher momentum (motional) states by the lattice, giving rise to the appearance of extra clouds. This is called matter-wave diffraction (See below).